As Internet prevails, e-learning becomes [more and more?] popular. GIS Research Centre, FCU had incorporated research results into blueprints for teaching programs and then created GIS education program. The Center has also assisted Feng Chia University in the development of an e-learning platform, which ensures exchange and sharing of teaching resources. shares GIS teaching resources, develops GIS applications programs, provides a GIS teaching platform called “e-Design”, operates a GIS data warehouse, and teaches students how to apply spatial information. Instructors teach students how to use spatial data as a GIS resource and provide them with GIS expertise. All the courses provided by the Center are combined into general theme courses The teaching process is based on a series of projects and follows the concept of Problem Based Learning (PBL), which encourages teachers and students to apply concepts and skills to investigate real-world issues. Feng Chia University has made an alliance with other universities in Central Taiwan. The Center has developed a platform dedicated to sharing educational resources and student services called “Regional Planning and Educational Resources Platform”. The system integrates Google Earth to provide all users with satellite images and spatial data. This interactive platform is dedicated not only to students but also to the faculty of universities in Central Taiwan. On the one hand, students can search for spatial data for their projects and home-works. On the other hand, the faculty can use the platform to discuss policies and allocate resources. as the hub of Central Taiwan universities. The aim of CTTLRC Project (Central Taiwan Teaching and Learning Resource Centre) is to integrate the educational resources of 12 universities in central Taiwan. To overcome the problem of distance, a system of e-platforms has been established. The e-platforms provide coordination of web service access among the educational community, strengthening the inter-institutional cooperation. All universities in Central Taiwan share teaching materials and provide courses which can be selected by students from different schools. E-learning provides synchronism and asynchronous courses. The center has also developed a sharing platform to integrate student affairs in Central Taiwan. E-learning platforms provide universities with access to adequate resources that support in-depth investigations. 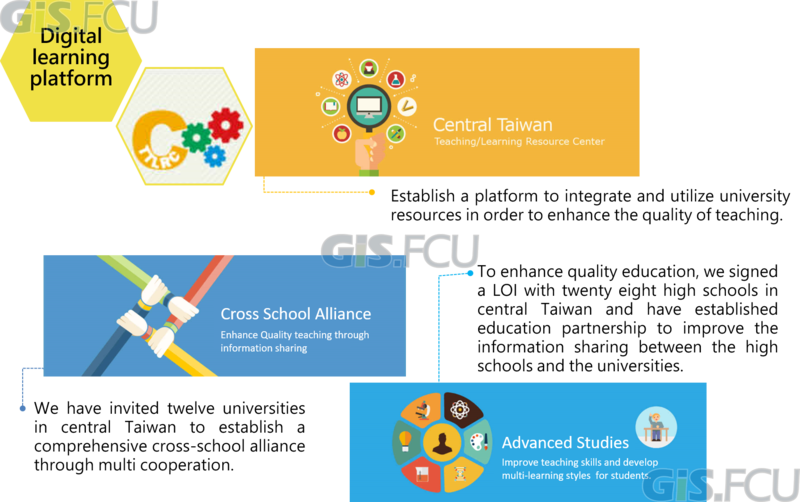 Because experiences in using e-platform to share and publish GIS educational resources have been transferred to the partner universities in Central Taiwan, GIS.FCU makes steady progress in adopting open standards and distributed computing technologies in the field of academic research. The proposed architecture provides heterogeneous resources including data, data processing and computing power interoperability. Tien-Yin (Jimmy) Chou, the Co-Chair of the University Domain Working Group(DWG), has contributed to coordinate Asian countries to develop OGC best practices. The OGC Asia Forum has been established in 2011. In the future, Prof. Chou will invite more professionals and scholars from government units, academic institutions and commerce companies to join the OGC Asian Forum. 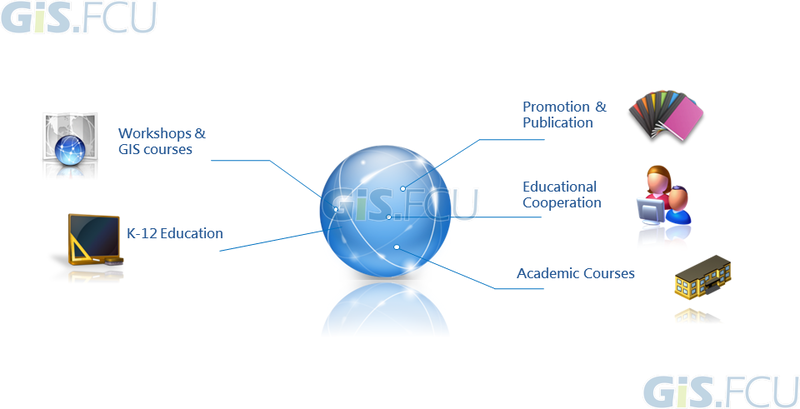 It establishes collaborative mechanisms to share educational resources among universities and provides concepts related to decision-making support in teaching and learning. Moreover, as more professionals participate in OGC projects and processes, the development of OGC best practices in Asian countries will become more coordinated. Figure 4 The 1st OGC Asia Forum has been established by the Center in 2011.